Just letting you know that we've just updated the list again! There were some good tapes on that last list and they went fast!!!!!! There is some pretty good stuff on this list too! Take a look at our list - www.katestrackshack.com and let us know if you see anything you want to buy. Also, if you want to be added to our "subscriber" list to be notified when the list is update, just send us an email with "subscribe" in the subject line. It's sleeting and cold outside! I'm going to go start a fire and finish reading a good book before I start on the dreded homework! "When I die and I lay me to rest, gonna go to the place thats the best". Who has not heard that immortal lyric at least 100 times? It was with great excitement when I came across this admittedly ratty look cart. Let me start by saying that this is a rare cart. I have seen literally tens of thousands of 8-tracks, and this is the first copy of this I have ever come across. Except for Sinatra and Martin, Reprise 8-tracks are not all that common in the first place, so that may play a part in the scarcity of this cart. Another player may be that it is not very good. Of course, the title track is a AM/FM classic, and it deserves to be. Nothing else on the cart comes even close to "SITS", either for musicanship, or songwriting. The low point is "Milk Cow". This album smells like it was thrown together around a hit single. The biggest bummer about this cart was that it was one that I had been looking for for some time. Oh well. Norman Greenbaum has a website, and I emailed him to let him know that I had just finished listening to him on 8-track. His response was basically "I am on 8-track. Wow". I thought that was a cool response. Maybe some day I will be on 8-track too! Wow! Keeper? : Nah. If you want it, trade me something cool for it. Number of ka-chunks: Only one, and that is due to "SITS" itself. This is Dan. This is the first in a series of reviews I plan on doing on different carts as I listen to them. Lets start off with "The Very Best Of Deep Purple"
I found myself enjoying only about half of the songs on this cart. "River Deep - Mountain High" and "Kentucky Woman" are the highlights. "Hush" and "hey Joe" are OK, but not in the same class. Overall the cart sounds great, and there is no track splitting. Keeper? : - for now. I think there is a later Deep Purple greatest hits around here somewhere that includes their "Smoke On The Water" stuff. Still...I really like their version on a Neil Diamond song on this album. Number of Ka-chunks? : Only two out of four. Just letting you know that a new updated list has been put up at our website - www.katestrackshack.com. Check it out and let us know if you see anything you want to buy. Remember, we also do repair work and transfer 8-tracks to cd. It's been so busy around here!!! Sales of tapes have been really good and the repairs have been even better! 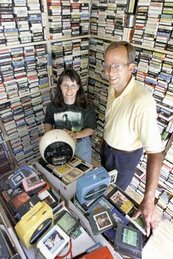 I just purchased 400+ tapes a few days ago from a nice gentlemen in Oklahoma. He has a bunch of 45's if anyone is intresested. Just let us know and we'll get you his contact info. We'll also be going to Houston this weekend to pick up about 2500 more tapes and players! I'll start my last semester tomorrow night! Wish it wasn't quite so late, but you gotta do what you gotta do! The worst thing about it starting tomorrow is that is our 20th Anniversary! I'm going to try better at keeping this blog up-to-date! !